The Respiratory System ensures that cells get oxygen & carbon dioxide is eliminated as required. In this system the following six parts play important role. of the respiratory system. Alveoli are numbered to about 300 millions & can easily cover the surface of a football field of 100 square meters. By the process of diffusion the Oxygen is exchanged with carbon dioxide – replacing each other. The oxygen diffuses to blood through Alveoli & on to capillaries. Once a breath is taken in the external inter coastal muscles get contracted elevating the ribs & sternum. The thoracic cavity increases in its dimensions from front to back. Thus lowering pressure on the lungs.Therefore the fresh oxygen laden air enters the lungs. The diaphragm contracts & lowers itself so there is increase in vertical dimensions of the lungs and reduction of the air pressure. This also allows in the supply of oxygen laden air to the lungs. 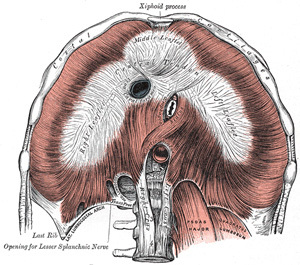 This activity of the diaphragm results in more oxygenation of the blood. In majority of cases people use only the chest muscles to breath in which is incomplete & deficient as compared to diaphragmatic breathing. 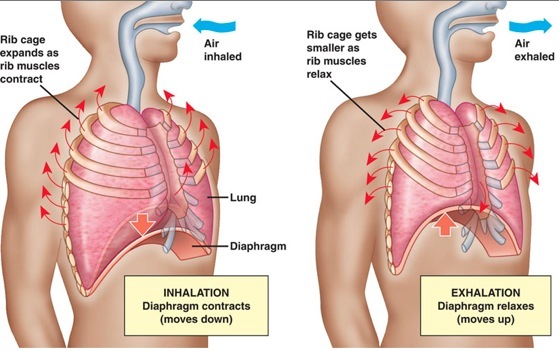 It is estimated that diaphragmatic breathing air is 10 times more in volume than of breathing with the chest muscles’ breathing. 1. Pranayam can be preformed in a suitable position. One should be at ease mentally. Ensure that your back is straight & erect. You may sit on a chair or lie in a bed in case of inability to sit on floor. The seat should not be too soft. The neck, spine, chest & the hips all should be errect to get the best results. 2. Keep all the organs eyes, lips, mouth, nose in natural condition & eyes closed. The mind should be calm, with no tension. 3. Before starting Yoga, chant OM & if possible sing a song or a prayer. This will calm your thoughts & mind. 4. Pranayam is controlling and balancing the speed of breath and Pran and also putting the mind on one particular subject with total concentration. 5.During pranayam, please ensure that you do it without exerting any pressure n the respiratory system while stopping the breath. Poorak: Inhaling. Stopping after filling is called kumbak, exhaling is called rechak. Stopping the breath outside is called Bahya Kumbak. 6.Always eat simple & non oily food. Plenty of green vegetables,fresh seasonal fruits, coarse & sprouted grains. 7. Pregnant women shall not do kapapbhati, Bahya Pranayam, and Agnisar. Remaining pranayam can be done slowly & surely a healthy & intelligent child will be born. 8. If you feel tired during Yoga practice. Stop & relax for some time . Take 5-6 long breaths & then resume. 9. Paranayam should be practised according to the season & the body constitution(age). Some pranayam raise ethe body temprature , other cool the body. 10. The mind should be calm & happy during Yoga practice. Conversely yoga induces mind to be calm & be focused. 11. At initial stages the one should practice Yoga for 5 to 10 minutes. Slowly, say between 2-5 months, the time limit may be increased to 30 to 60 minutes. One should ensure that , stomach is clear & if necessary take HARDD or TRIPHALA the night before with hot water before sleep. 12. Paranayam should be practiced 4-5 hours after taking meals, preferably in the morning ( the best time for Yoga) after the ablutions. Sit in very well ventilated place. The seat should have warm & cosy sheet or a sheepskin. 13.In cities usually the environment is polluted, it is good to burn Guggal or Ghrita so that the place is full of fragrance. It is recommended to burn an oil lamp with clarified butter. 14. To start with 30 minutes before the Dawn is best time to practice the Yoga.